rec. July 2016, The House of Radio, St. Petersburg. In 1935 Sviridov composed a cycle of lyrical romances based on the poetry of Alexander Pushkin, which brought him critical acclaim. Indeed, it was through the Olympia label’s issue of his choral music that I first made his acquaintance as a composer. A quick look in Wikipedia will reveal his long list of Soviet honours. He managed to remain in official favour throughout his life by producing scores of which the Communist authorities approved but which also expressed his own deeply felt attachment to the idea of “Mother Russia”, past and present. This CD presents us with an orchestration by Evgeny Stetsyuk of Sviridov’s song cycle Russia Cast Adrift, to poems by Sergey Yesenin, a poet whose work had long held an attraction for him. He had intended to orchestrate the piano cycle himself, mentioning it in his diaries from 1981-1982, but died before doing it. Sviridov had incorporated folk music into his compositions on several occasions. For this orchestration, parts for Russian folk instruments were included within the full orchestra. The informative booklet mentions the gusli, domra, accordion (bayan) and balalaika, played here by the Style of Five folk ensemble; it also mentions that they use electronic “instruments” as well. Dmitri Hvorostovsky claims a strong attachment to Sviridov’s music, as well as a deep respect and liking for the man himself. The baritone was 54 when this recording was made. He was in good voice, his rich Russian tones either ringing out or caressing the listener’s ears in velvet utterance. I do not think that his voice has survived the last thirty years without any signs of wear—that would be impossible—but such signs are slight. In the course of a year, I listen to the recorded voices of many baritones, and I can think of some, younger than Hvorostovsky, who sound poor indeed in comparison. The music has not such an individually memorable cast to it as some other music by Sviridov that I have heard, such as the Three Choruses from Tolstoy’s drama Tsar Feodor Ioannovich or Pushkin’s Garland, but it is good stuff to listen to nonetheless. Completely tonal, it is less exploratory and nowhere near as searing as the music of Shostakovich. Nevertheless, it exploits a range of emotions in illustrating words that, in most of the poems, create a religious image in one’s thoughts, or in others, show us the deep feelings that the wide Russian countryside was able to rouse in the poet’s mind. In some (though definitely not all) of the songs I get the occasional impression that if Russian folk/popular music is not being used, then the composer is quite adept at simulating its idiom. There is a small filler in the shape of an excerpt from Sviridov’s St. Petersburg – a vocal poem, entitled The Virgin in the City. This is very nice and perhaps more immediately memorable than the preceding tracks. The orchestration is vivid and powerful, and the recording appropriately spectacular. 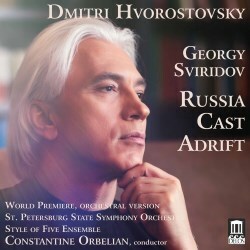 Hvorostovsky’s voice is well balanced in relation to the orchestra, and occasional unusual sounds point to the inclusion of the five-strong folk ensemble. The booklet contains full texts and translations into English as well as details of the artists. The playing time of this CD is short, but its selling price has been reduced accordingly. It can easily be found on offer for less than £6.